Eliminating marine holding tank odor just got easier with the best holding tank chemical available. Odor Free uses time release granules to knock out odor: 1. on contact, 2. control odor for days and 3. control odor for weeks. It contains tissue digesters so that you can safely use toilet tissue from home, making it more convenient and saving you money by eliminating the necessity of buying expensive biodegradable tissues. 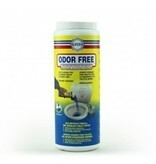 Odor Free also breaks down and prevents sludge from fouling tank sensors and tank walls. You'll love the pleasant scent. Never be too embarrassed to Invite guests aboard again! Proven, Time Release Granules assure positive hygienic control and a pleasant fragrance between pump outs. 720 g.